For those who wish to experience more. It seems almost unnatural, to want to be able to leave your body and experience what some people consider the state of death to be. For many it is a curiosity, maybe they heard about it from a book, video game or a movie, and decide to look into it. 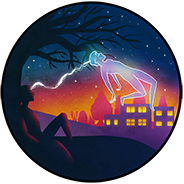 Many researchers over the year, most notably Robert Monroe, have essentially dedicated their lives to astral projection, coining many terms and explaining many concepts to those unfamiliar with the subject. The astral projection techniques here have been gathered from many sources, some are very well known, others are a bit more esoteric. Start here for a guide on how to prepare yourself mentally and physically for an astral projection attempt. It is good to read this first, some of these methods can be practised in your everyday life. The following techniques should be used when you are in the correct mental state; calm, quiet and comfortable. Click on the image of each technique to learn how to perform it. The Monroe technique is one of the more popular methods, and should be examined first if you are not familiar with Astral Projection.